Having had no success with the chickens, the bear has since moved onto raiding the neighbour’s pear tree instead. 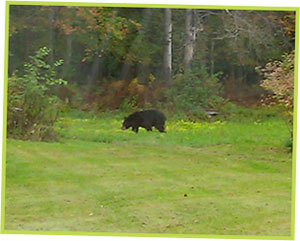 Carol spotted two black bears tucking into the pears just a few days later and even managed to get a photo of them! 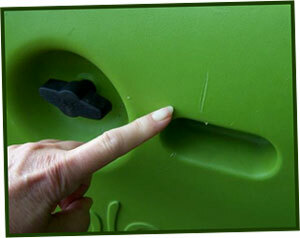 You can see a photo of one of the bear scratches too – proof that the Eglu has been brilliant again! Thanks to everyone that entered last month’s Crossword Competition. The lucky winner was Cara Carey, and she wins a £50 voucher to spend in the Omlet shop. If you didn’t manage to get all the answers you can click here to see the full solution! And remember the Eggbods competition back in August? 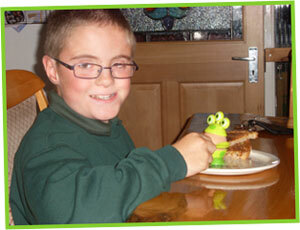 Well we have been sent a photo of 11 year old Liam having fun with his Eggstraterrestrial prize egg cup! His grandma, Avril, won it for him to encourage him to eat a boiled egg – although he loves chickens, he just did not like eggs! The good news is that with the help of the fun new egg cup he finished his first boiled egg. Hip hip hooray! Are you new to keeping chickens? Or simply want to stock up on your hen health supplies? Then you are going to love our new range of Multi Saver Packs on offer! Carefully selected by our chicken eggsperts, these packs contain great ranges of products that will save you money and make your hens lives even happier. Try the Chicken Keeping Basic Starter Pack for those essentials that you’ll need when entering the world of keeping chickens. Want to give your Eglu a good clean? Then give the Chicken House Hygiene Pack a go! Time to give your hens a tasty treat? Look no further than the Chicken Treat Pack…or the Chicken Mega Treat Pack for Seriously Spoilt Chickens (if you’re feeling generous)! Click here to see the full range and save yourself a packet!